A major study of the number of people treated after being attacked says serious violence is continuing to fall in England and Wales. 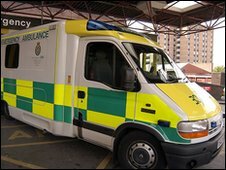 Cardiff University says 350,000 people were treated for injuries in 2009, 1,500 fewer than in the previous year. But the research also found that an estimated 2,800 children were treated for serious violence, up 8% on 2008. Figures from the 44 hospitals involved in the research showed a fall in the number of young teenage victims. The research was carried out by a specialist team at the university who annually track the number of people treated in casualty departments after being attacked. The team said that last year's 0.4% fall in the number of patients was slight, but it also meant there had been 64,000 fewer victims turning up at hospital than in 2001. Professor Jonathan Shepherd, head of the research at the university's Violence and Society Research Group, said the only rise recorded during the lifetime of the study had come in 2008. The latest figures showed that there had been a slight rise in victims among 18 to 30-year-olds, the most likely victims of violence. At the same time, an estimated 50,000 young people aged between 11 and 17 were treated following an attack - a 6% fall on the previous year. "We're not precisely sure why that might be but there has certainly been a greater emphasis on dealing with youth violence," said Prof Shepherd. "It may well be that the increase in focus on that age group is part of the explanation." And while children under 10 years old accounted for less than 1% of all victims, the estimated rise in that group was real, rather than just a statistical quirk, he said. Prof Shepherd said one theory was that changes to care proceedings could have played a role in the rise, saying that more young children might have been left in abusive homes. But Marion Davis, President of the Association of Directors of Children's Services, disputed the theory, saying that an independent review had concluded that no children had been put at risk by the changes. "There is insufficient information in the report to start identifying the causes of this rise, though it certainly warrants further investigation," she said. "It is not even clear if these figures do reveal an increase in abuse of children - the violence could have been perpetrated by another child, for example." Some hospitals have individually separately reported increases in serious violence, including doctors at the Royal London Hospital, a leading trauma centre which was not part of the study. Separate figures released to Parliament in February showed an increase in the number of under-16s admitted to English hospitals for stab wounds between 1998 and 2008 - but then a fall last year. Professor Shepherd said that while the Cardiff study omitted some major hospitals, it had been structured to accurately uncover national trends across all NHS regions in England and Wales. He said that its findings also reflected separate data collected by the massive British Crime Survey (BCS), the government's preferred measure of incidents. "We set up this annual survey to bring clarity to violence trends in the face of often contradictory findings from police statistics and the BCS - but we find now that this information from accident and emergency departments matches the BCS really pretty closely," he said.